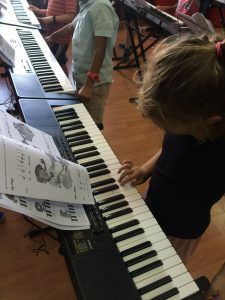 Grade 2 hits the keys! Students in Grade 2 had their first lesson on the keyboards today! They were asked to identify all “C”, “D”, and “E” keys on the piano. After practicing “C”, “D”, and “E” they learned their first song applying the notes. The room was buzzing with excitement!